I was watching last year’s Christmas episode of the excellent 30 Rock last night – just the right side of diabetes-inducing levels of schmaltz – and it’s got me thinking about how having a child has completely changed my attitudes towards the holiday season. It’s not that I’ve become all bah-humbug about the most wonderful time of the year (as the old Andy Williams song goes), but it would be fair to say that, for me, the magic had gone out of it some time ago. I think it happened at the point I realised that I was earning enough money that, if I wanted something, I could simply go out and buy it. And that’s usually exactly what I would do. To avoid present-giving disappointment, we now have an embargo in place where I am not supposed to buy myself anything after the beginning of November; instead it is added to my Christmas wish list. Which is fine, and I do understand the need for it – after all, it saves a lot of fiddling around with receipts and returning unwanted gifts – but it also means that I end up having to wait up to eight weeks for something I could easily have bought myself today. And then consequently leads to me rushing out to buy all the things on my list that weren’t given as presents. Honestly, I’d really rather have cash or some small token gift to unwrap on Christmas morning. It’s the thought that counts. Really. However, Christmas is a bit different when you see it through a boy’s eyes (that’s Jamelia, for those of you who have spotted that I’m inserting song titles at every possible opportunity). 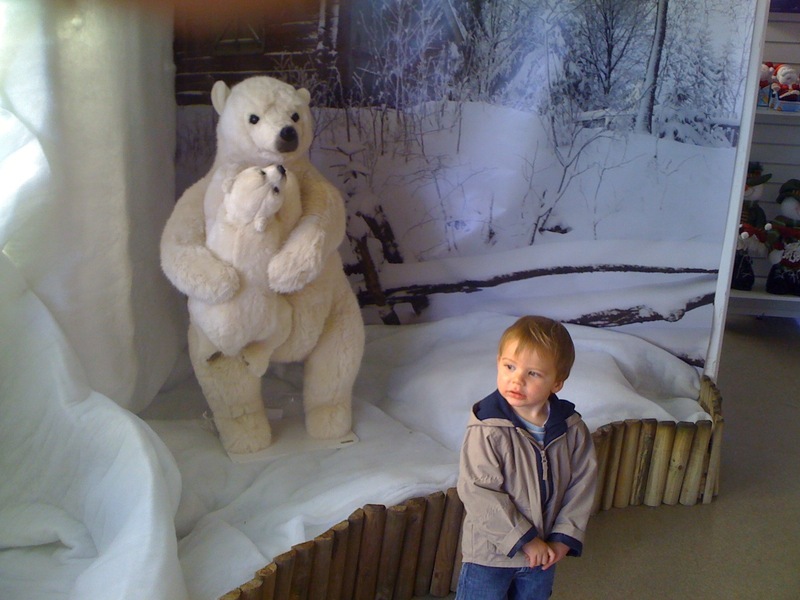 Last weekend I took Isaac to our local garden centre to burn off a bit of excess energy – boy, does he have plenty of that! – and discovered that they had just put out all their Christmas stuff, ranging from illuminated snowmen for the front garden to cuddly toys (that’s Roachford, for eagle-eyed 80s pop spotters) to £250 artificial trees with built-in blinking lights. He lapped it all up; in the end, I had to physically drag him out after an hour so we could go home for lunch. Already I’m busy picking out various odds and sods he might like – I bought a couple of small baubles he took a fancy to at the garden centre – and accumulating a variety of stocking-fillers for him to tear into on Christmas morning. Military campaigns have been less precisely planned. So now, for the first time in years, I’m really looking forward to Christmas, as opposed to dreading fighting the screaming hordes for the last Nok Tok talking doll in an overcrowded shop playing incessant seasonal muzak. (We’ve already ordered all his presents online, anyway.) Not because anything has changed with me; I know I will – gratefully – receive the usual array of books, CDs, DVDs etc (and then buy everything else later) on the day, but because I know Zac is going to love all the seasonal rituals, from the opening of wrapped presents to the excesses of Christmas lunch (he loves a good roast; he takes after his father).